Everyone knows you can type horizontal text in Flash CS4, but did you know you can change the direction of the text to vertical. 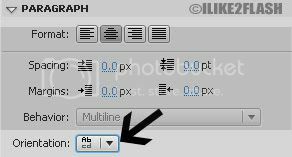 You can change the direction of the text without using the transform tool, or repeatedly pressing the enter key to form a vertical line. Firstly, you need to select the Text tool (T) then locate the ‘Paragraph’ section on the properties panel. If you can see the properties panel, select Window > Properties (Ctrl + F3). Now select the ‘orientation’ button as shown above. You can either select the vertical left to right, or the vertical right to left. Both of these options set the text vertical, but change the reading point of view as shown below. As you can see below the ‘vertical left to right’ expands the text field to the right. 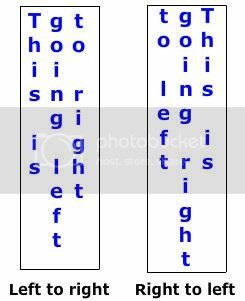 While the ‘vertical right to left’ expand the text field to the left. This is a great feature for people using different languages because you can easily change the character flow from left to right. The orientation button also lets you switch between horizontal and vertical text which avoids you having to manually edit the text. You can change the default text setting to vertical in the Flash preferences by choosing Edit > Preferences > Text then checking the ‘Default text orientation’ box. 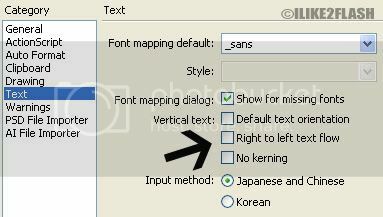 You also have the option of change the text work flow and disabling the kerning.